Winter NAMM at Anaheim’s Convention Center seemed to be even more crowded this year despite one of the big name guitar manufacturers not being there. With a new building in addition to all of the original buildings, the convention was crammed with everything having to do with the music industry: live gear, software, studio gear, classes about production, promotion, and positivity, live music all over the place, inside and out, and friends reconnecting as well as networking with new folks. As exhausting as it can be, the satisfaction is the afterglow of the NAMM show. 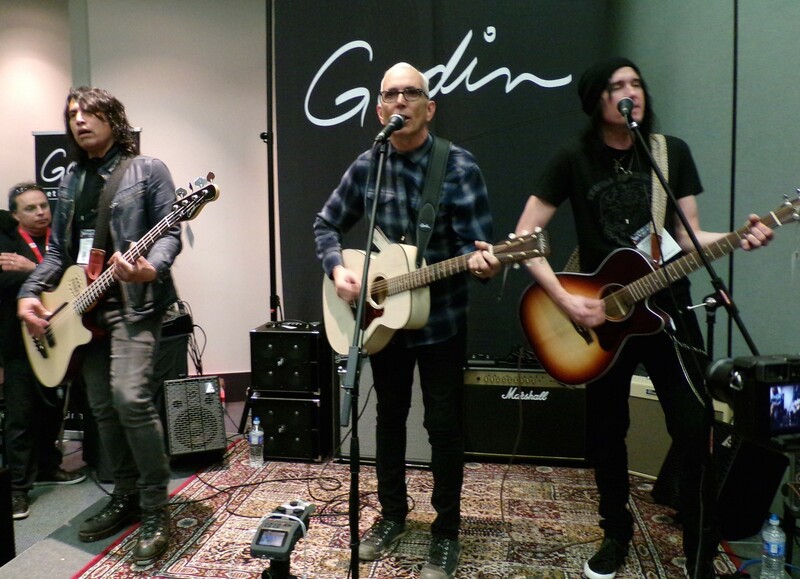 Wednesday was preview day for media, so Guitar Girl was privileged to see lots of new gear from the 20+ companies who were chosen to show in the main hall, plus special events given by Martin, Yamaha, Fender and more. A highlight was going to Martin Guitars, meeting Jacqueline Renner, President of C.F. 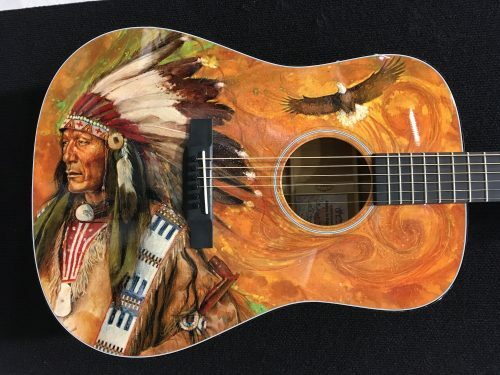 Martin, learning more about Chris Martin’s new “Reimagined” Standard Series and seeing one of their beautiful artistic acoustic guitars whose Native American art theme was created by artist Robert Goetzl. The artist was there to answer questions and explain his process. 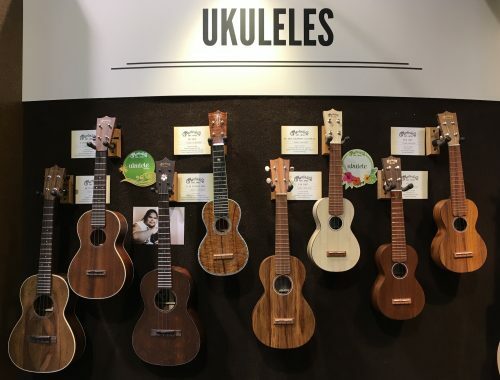 Martin also had some new strings and ukuleles to show off this year, along with some gorgeous acoustic guitars. Fender had an event for media and VIPs as well, which Guitar Girl also attended. 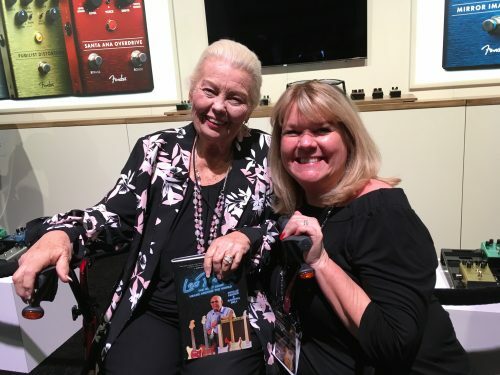 We were able to meet and chat with Phyllis Fender, who had her book in hand, ”Leo Fender: The Quiet Giant Heard Around the World.” Co-written with Laguna Beach author Randall Bell, also in attendance, the book is all about her husband, the incredible designer technician, Leo Fender, and was released in November. 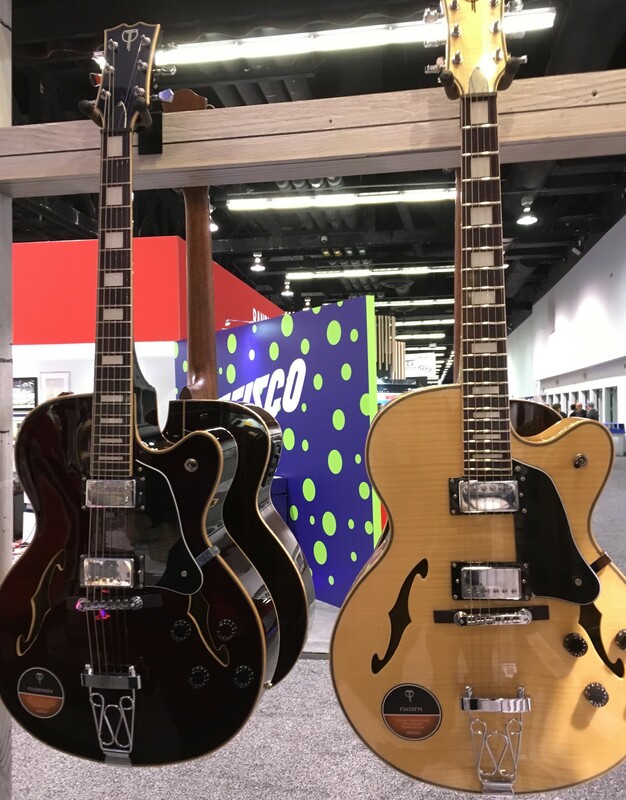 The first day of NAMM was already crowded, more like a weekend day instead of a Thursday, so the GG staff headed out to cover some live events and see what fun gear we could find. Highlights were Teton Guitars new CH300 hybrid guitars that have a stereo output. These sound great and are priced in the $800-$1200 range. We look forward to possibly reviewing one of these beautiful guitars. Sennheiser had a larger stage this year with a great variety of music, including Randell Kirsch and LuAnn Olson with their son Bryn sitting in on upright bass, Ronee Martin, Julia Othmer, Luci, Debby Holiday, Marina V. and more. We were happy to catch the Tim Moyer song circle, at the Marriott, with Tessa Delee and Steven McCormick who also had his daughter on stage to sing and play keyboards! That evening D’Angelico had a special VIP event featuring Bob Weir playing his signature guitar with band members Jay Lane (RatDog), Paul ILL (Disreputable Few), Isaiah Sharkey (D’Angelo/John Mayer), and Boyd Tinsley (Dave Matthews Band). 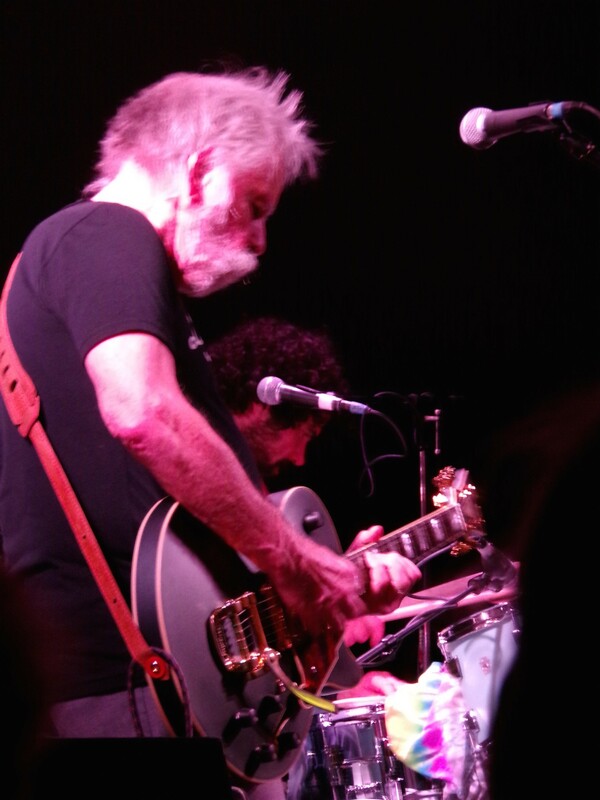 The band rocked mostly Dead tunes and Weir showed off his guitar chops with little effort. Earlier that day Bob received the National Association of Music Merchants (NAMM) Music For Life Award at the opening day’s breakfast event at the Hilton. Friday continued the awesomeness of NAMMdom. GG was able to catch the incredible Alice Wallace on the new Plaza Stage next to the new annex of the convention center. This Southern California songbird’s powerful, elastic singing and melodic, literate song-crafting have been earning her accolades across the country over the past several years. 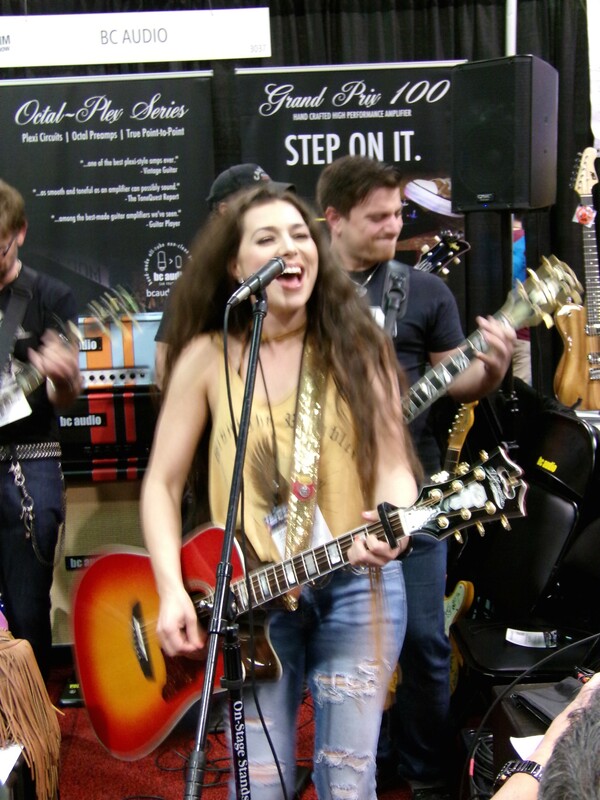 We were lucky to catch the rising star, Jessica Lynn, and her band at multiple locations around the NAMM show this year. Here is a little bit from the BC Audio booth where you can hear other bands trying to drown them out! She also performed with her full band on Saturday at D’Angelico, where she is an endorsed artist! Look at how she brightens the room! Guitar Girl popped by the Thimble Slide booth, Harmony, Fishman, and more to check out guitars and accessories, checking out stomp boxes and processors that we would like to review! 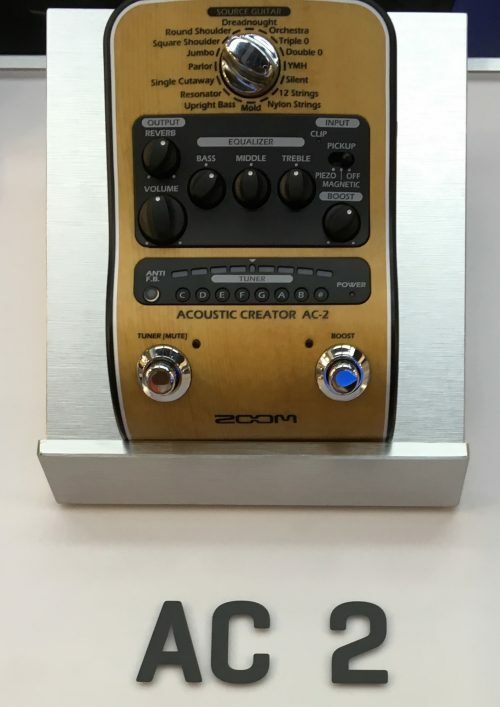 ZOOM’s Acoustic Creator AC-2, a nominee in the TEC Awards Musical Instrument Amplification & Effects category, is a little workhorse that we would like to play around with more! Saturday took us everywhere, from live music at the Marriott and Hilton Hotels on site, to the giant Yamaha section, located at the Marriott, where they were kind enough to offer the Bloggers Lounge to the media again this year. This was a great spot to grab a coffee, upload some photos to twitter and reorganize and reenergize! The Bloggers Lounge had a small stage with a couple of guitars leaning against the wall, including the new Trans Acoustic model that one of our guitar reviewers had been trying to get her hands on all weekend! 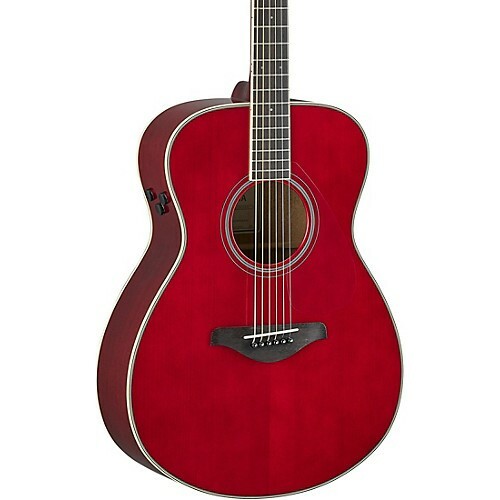 This particular one, the FS-TA, in ruby red, is a small almost parlor style shaped guitar, beautiful, and sounded fantastic in the room. Yamaha’s groundbreaking TransAcoustic technology delivers onboard reverb and chorus effects. When you engage the effects via the simple-to-use controls, and it’s like you’re playing in a rich, ambient venue — no amp or PA required. (Someone in the room asked me what settings I had the P.A. system set to and could not believe that it was not plugged in!) Full review coming soon with one of these new technologically advanced guitars from Yamaha. We caught Hummingbird Hotel in full band mode (from San Diego) with David Stranger and Megan Love as the driving force duo, performing at the Hilton Hotel right as the TEC Awards were getting ready to start! (TEC Awards article available on this site HERE!) Then after the TEC Awards we headed over to the Ultimate NAMM Jam Night, where the UJN from Tuesday nights at the Whisky A Go Go put on a special jam night for NAMM. Chuck Wright and Mitch Perry, house band members for Ultimate Jam Night, organized the usual suspects plus a ton of well-known musicians to play while in Anaheim for NAMM. The night rocked! Being the last night of the NAMM show, it was party central everywhere! Sunday is always the wrap-up day, the chill day, and go by any of the booths you may have forgotten or have run out of time to be able to go see. I was able to swing by the Rupert Neve booth and see their TEC Award for the Microphone Preamplifiers category, (so cool!) and catch a couple of more music events, like The Junebugs on the Arena Stage! 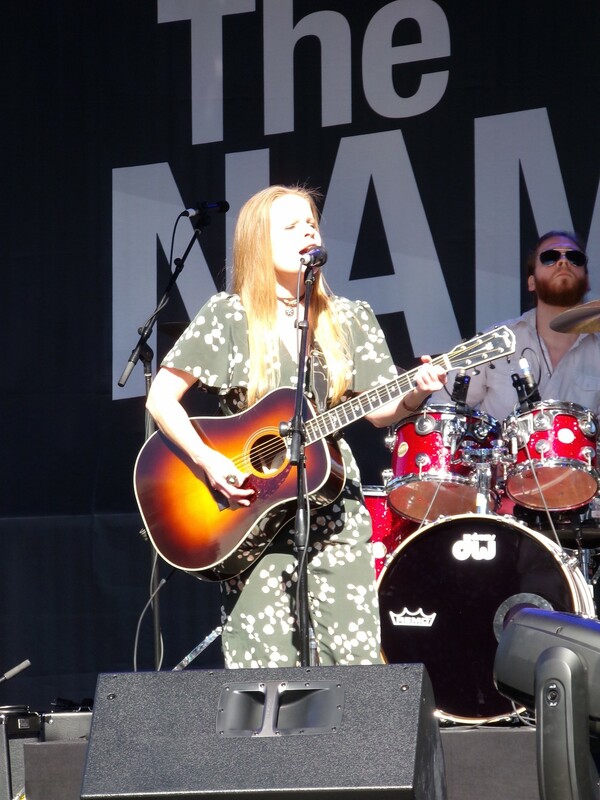 Guitar Girl was thrilled to see so many women in so many different roles at NAMM; from Presidents and owners of companies, to heads of PR agencies, mentors, players, songwriters, producers, and more. Now that NAMM is over, it is time to enjoy the afterglow and soak those feet!